Musk, disputing a Wall Street Journal headline, tweeted: “Revenue to Tesla is unchanged." NEW YORK (Bloomberg) -- Tesla CEO Elon Musk tweeted that sales of the electric Model S rose 65 percent in North America last month and reached a “record high” worldwide. Tesla shares rose 9.5 percent to $242.77 today. On Monday, the stock slid the most since Oct. 10 after the Wall Street Journal, citing WardsAuto.com, sent a headline indicating Tesla sales had declined 26 percent in September, a figure later clarified as referring only to U.S. sales. Musk’s tweet addressed concerns raised by Brian Johnson, an analyst at Barclays Plc, that the company might not be able to meet its aggressive growth targets, such as its fourth-quarter forecast of about 13,000 sales. With September North American sales “well ahead of our estimate,” Tesla’s full-year goal of 35,000 Model S deliveries worldwide is “more achievable,” provided sales in Asia increase in the fourth quarter, he said in a note to clients. Tesla’s third-quarter North American deliveries probably rose to about 4,900, Johnson estimated, based on Musk’s tweet. If worldwide deliveries totaled 8,800, then the company may have earned 25 cents a share, Johnson said, far exceeding his estimate of 5 cents. The upstart company aims to increase vehicle sales by more than 50 percent this year to 35,000 and accelerate its build rate to a 100,000-car annualized pace by the end of next year. 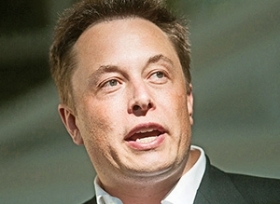 In a separate tweet, Musk also disputed the Journal’s characterization of a new lease offer as a discount. “Revenue to Tesla is unchanged,” he wrote. The Journal had said that Tesla is offering “two new sales incentives,” referring to the electric-car maker’s new lease offer through U.S. Bancorp that will lower monthly payments by 25 percent and a satisfaction guarantee.